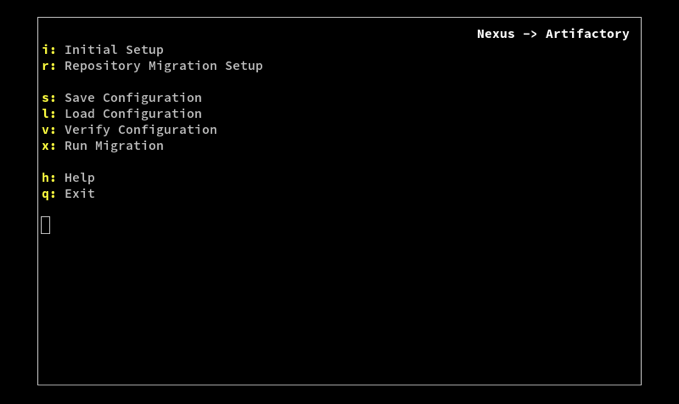 Migrating from Nexus to JFrog Artifactory is very simple by using nexus2art migrator. The migrator provides a user friendly wizard like interface for transferring everything in your Sonatype Nexus instance repositories, artifacts, users, and settings to an Artifactory instance. Migrator tool requires an initial setup (i) to connect to your Nexus and JFrog repositories. Once initial connectivity has been established then repository migration setup (r) needs to be configured. Migrator is intelligent enough to validate all naming convention and repository types. If there is any kind of validation failure then it will highlight the error with a red exclamation mark. In repository migration setup you can view all repositories and select which one to include/exclude as part of the migration. If there are any shadow repositories then it will highlight those with error and you have to exclude those from selection as utility/tool assumes that main repository is part of migration. Did I mention about migrator context sensitive help menu option. You can anytime click help (h) and click any option selections and help will use its intelligent logic to provide a user friendly help. Nexus2Art migrator provides flexibility to save (s) the configuration so that you can work on it later after loading (l) the configuration. All the configuration files are saved in JSON format if you would like to update manually. Once all the configuration is done then you can verify the configuration by selecting Verify (v) configuration key. Verification utility will validate Nexus and Artifactory and apply all the configuration to identify any incompatibilities. This is a very handy utility to use when you know that some of the configuration might have been updated in either or both. With nexus2art migrator you can move your operations from Nexus to JFrog Artifactory and be using the only real universal repository manager with full support for all major packaging formats within minutes.